Food. We all need it. And there’s more than enough, in fact, to go around. According to the USDA Economic Research Service, in 2010 (the most recent year for which data is available) the U.S. food supply provided 4,000 calories per person per day, yet the average American consumed far less at just 2,476 calories per day. Still, even with the excess production, which is estimated to be even greater today, more than 40 million Americans face hunger. So while some Americans are eating more and wasting more, in other words, many barely have enough to eat. But all is not lost, thanks in part to individuals, educators, politicians, researchers, agbioscience companies and many others who are diligently working to transform our current food system. Right here in the Hoosier State, AgriNovus Indiana—a statewide initiative working to promote and accelerate the growth of the agbioscience industry— is pushing the envelope to foster a world where innovation and research come together with globally traded companies, family-owned businesses and entrepreneurs alike to create solutions and, hopefully, foster a healthier, more sustainable future for all of us. But first… before we can feed the hungry… before we can make sure that the food we produce makes it to our plates and not a landfill… we have to take a long look in the mirror and recondition our minds to what constitutes edible food, and what doesn’t. We have to rethink the spots on our apples. 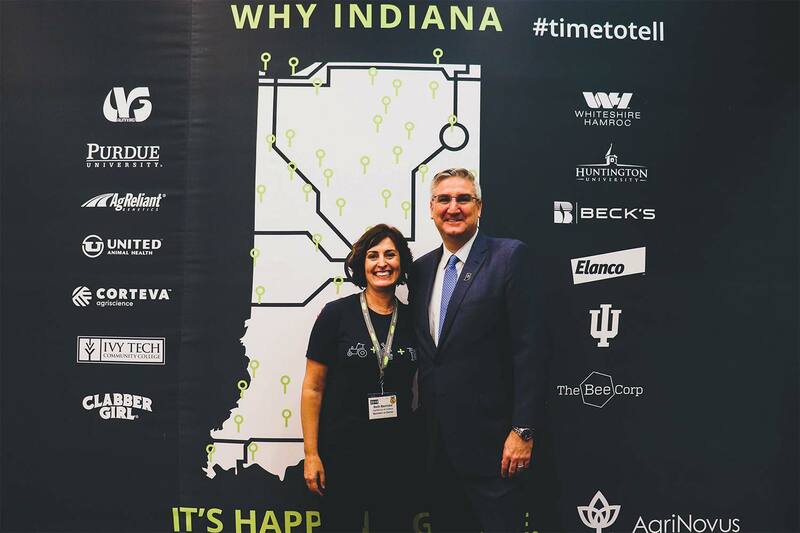 Indiana Governor Eric Holcomb and AgriNovus Indiana President and CEO Beth Bechdol at the 2018 National FFA Blue Room presented by AgriNovus Indiana and powered by Microsoft. Photograph courtesy of AgriNovus. Yes, yes. We’ve all done it—used a filter to make our food photos closer to what we perceive as perfect: our salmon the perfect shade of red; our egg yolks the perfect hue of yellow; our greens, as green as they can be without making it obvious that we used a filter. Did she? Or didn’t she? But, I mean, why not? If magazines can airbrush humans, why can’t foodies do the same for their Instagram feeds? But the demand for blemish-free produce goes well beyond our social media requisites. Consumers rummage for that perfect piece of fruit before they’ll place it in their carts, grocers sort and discard before stacking it on their shelves, distributors do the same before packing it in their delivery trucks as do farmers before bringing it to market. Why? Because here in America we’re programmed to not only want the best, but also to expect it and that mindset has led to an unprecedented level of food waste. This is where the innovators and industry leaders working in the agbiosciences don their superhero capes and swoop in to help us rethink the entire concept of perfect produce. “Agbiosciences is the sector where food, agriculture, science and technology all converge,” says Beth Bechdol, president and CEO of AgriNovus. “Think about it as a simple addition equation: ag plus bio plus science,” she says of the term. The work being done within the industry, she explains, essentially merges modern, innovative agriculture—or what most people think of as farming or production agriculture—with biology (aka the life sciences, human health and nutrition) and other sciences including tech, engineering, coding and so much more. 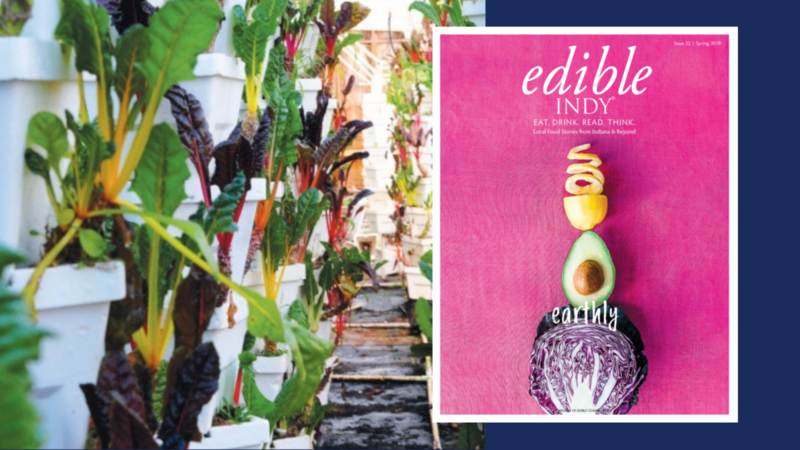 And here in Indiana, the sub-sectors of innovation with the greatest strength and potential opportunity are plant sciences, animal health and nutrition, human food and nutrition and high-tech agriculture. According to the Indiana Economic Development Corporation—a partnership governed by a board of directors focused on growing and retaining businesses in Indiana as well as attracting new business to the state—in 2014, the agbioscience sector contributed roughly $16 billion to Indiana’s gross domestic product (GDP). As a whole, agriculture contributes roughly $31.2 billion to the Hoosier GDP annually, and the agbioscience sector accounts for nearly half of that. A 2016 study on Indiana’s agbioscience workforce conducted by TEConomy Partners, LLC, shows the agbioscience industry is a significant economic driver of Indiana’s economy, employing just over 75,000 individuals, not including primary production workers (farming). Furthermore, the industry has seen robust growth over the past decade. From 2003 to 2014, Indiana experienced a 22% increase in agbioscience employment compared with a 3% growth rate for Indiana’s total private sector. But while the agbiosciences have seen a huge increase in job growth and experts agree the future looks bright, it’s not without its challenges. “There’s a misperception that the food and agriculture sector lacks the innovation, ingenuity, creativity and technology that define other industries today,” says Bechdol. To that end, she says AgriNovus is working to correct misperceptions, accelerate early-stage companies and entrepreneurs and bring future talent into the agbioscience sector by partnering with colleges and universities, incubators, co-working spaces, start-up companies and entrepreneurial organizations—both locally and globally. And Indiana Governor Eric Holcomb agrees. “We’ve had the opportunity to proudly tell Indiana’s agbioscience story in a big way this year,” Governor Holcomb says. “We’ve formed new local and global relationships, held major conferences and welcomed new business investment to our state. The agriculture industry is being revolutionized by our leading Hoosier entrepreneurs, institutions of higher learning and companies who are meeting the modern needs of the world with their exports, services and products. 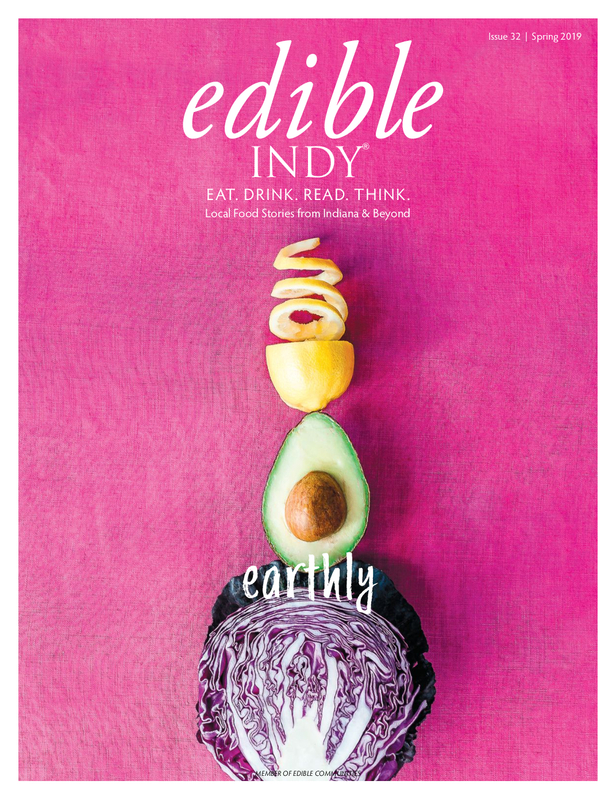 The agbioscience ecosystem is only going to keep growing, and Indiana’s own AgriNovus has been right in the center of it all.” And adds Bechdol, it’s advances in the agbiosciences that will serve to ensure we find solutions to some of society’s biggest challenges; one of those being food waste. What if we could eliminate hunger and nutrition issues and at the same time reduce food waste? The United Nations Food and Agriculture Organization estimates that nearly one-third of the world’s food supply never makes it to human consumption. Here in the U.S., the percentage is even higher and according to the Environmental Protection Agency, Americans discard so much food that it has become the biggest single component in landfills and incinerators. And the EPA, among other agencies, believes that reducing food waste is one of the top ways to reverse global warming. Yet there’s some good news. The people working in agbiosciences are discovering ways to use fewer resources while producing better crop yields and in turn, reduce food waste and protect our planet—case in point, brown spots on apples. Here in the U.S., apples are one of 10 approved GMO crops. The technology behind the innovations specifically used for apples help farmers produce fruit with less browning. And less browning means fewer apples are being thrown away because, well, because they’re no longer part of the “ugly” produce club. And its advancements in the agbiosciences that have helped produce more aesthetically appealing apples—among other items—not only to the consumer, but to grocers and producers as well. “Agbioscience innovation will allow us to feed the world, protect the planet and improve lives,” says Bechdol.